Latinos have risen to places of prominence in every walk of life in the United States, from politics, industry, and education to entertainment, journalism, and yes, car racing too. Kendell Lopez is part of a new generation that is building a successful future, while inspiring others, regardless of humble beginnings and very limited opportunities, to beat all odds and land at the top of their careers. Kendell’s story is a sort of a fairytale. However, her dreams are becoming a reality, and today she is NASCAR’s only Latina development driver. She also represents the so called Show-Me-State as the current Miss Independence. Racing has been a part of Kendell’s life for a decade, and she’s only 22. Her first series of competitive events was part of a Go-Kart system. “I was 14 years old at that time, but I’ve been involved since I was 12,” said Lopez who was very cheerful on the phone from her hometown in Independence, Missouri, because just minutes before our conversation she had a meeting with potential sponsors to endorse her for the upcoming nationwide season. “Our family summer vacation in Disney changed my life, literally. I discovered what I really wanted to do,” she said. It was on that vacation that Lopez was exposed to the Richard Petty driving school in Florida. It didn’t take long before she was hooked. Lopez never stopped believing in her dreams. She insisted over and over again, knocking on doors and making phone calls. Finally the I-70 Speedway gave her a chance to be part of the mechanic crew team, which more or less meant helping with cleaning and organization. Her hard work at the shootout paid off, and Lopez proved herself to be a shining example of how perseverance opens doors. “I was invited to become a driver in the new S2 division,” she said. “So, I accepted. Of course, I did! Lopez modestly attributes her success to having great mentors, taking stretch assignments, focusing on performance and loving what she does: Racing cars and conquering dreams. 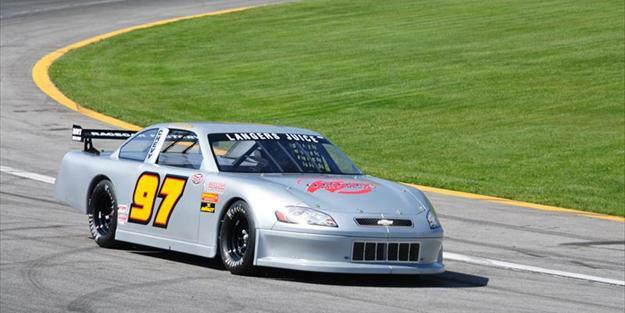 In order to be able to participate in the 2014 NASCAR Nationwide Season, Lopez must run in at least six races. The logistical and operational cost is about $250,000. She has started an IndieGoGo campaign to fund her competitive series. Juan Miret is a Tulsa, Oklahoma-based freelance writer whose work has appeared in various media outlets, as well as, at his own site Eñes and W’s.